The iPhone has proved a point: we love being connected to the internet wherever we are, and whenever the fancy or the need strikes us. And the only way that we can do that reliably is to connect to the mobile phone network; coverage and speeds vary - for the very fastest mobile broadband speed of 7.2Mb/sec, you'll need to be in central London or on the Isle of Dogs - but at least you will be able to connect and check email or log into essential online services. 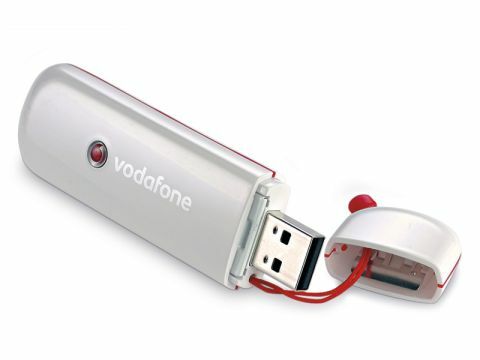 We've yet to see a more convenient and hassle-free way to do it than with Vodafone's latest USB modem; spec-wise, it's identical to the pebble-style unit that MacFormat took with it to the States but it's much more compact. An extension cable is supplied - just as well, since it's wide enough to block most second ports, though it does just fit into the recessed port on a MacBook Air - but you don't have to use it. A simple but welcome string keeps the cap tethered, and the preinstalled SIM card slots into a little tray. Installation is very simple, though Mac users still have to download the driver software rather than having it preloaded on the device, as is the case for Windows users. Throughout, although care has been taken to make the device work - and work well - with the Mac, there's much less hand-holding than Windows users get. Indeed, some of the installation advice suggests procedures that are perfectly accurate but nevertheless perhaps not the most efficient way to go about things. Worse, perhaps, is that some of the features that Windows users get - notably the ability to send and receive SMS messages from a software dashboard, and the ability easily to track bandwidth usage - are missing from the Mac software. In spite of this, however, it is still a good product. Once configured, you can initiate a connection within seconds, and it elegantly steps up and down the speed, depending on whether you're in a coverage area for one of the mobile broadband flavours or whether you have to slum it with GPRS; we used it on a train without any problems. Best of all, though, is the price. It's not so much the cost of the unit itself - like a mobile handset this was usually subsidised - but with the monthly cost and allowance of the contract. Now, you can pay £15 a month for 3GB of data, which we think is much more realistic than previous charges. You could also opt for a 5GB allowance for £25 a month, and even the fact that Vodafone has started quoting these prices including VAT suggests that the USB Modem Stick is ready for use by your average Joe. The only real bone of contention now is that Vodafone has removed the pay-as-you-go option, and has priced the device in such a way that it pushes customers to an 18- or even 24-month contract. Yes, we wish that Vodafone had put more work into bringing the Mac experience up to the level that Windows users enjoy - not just by supporting bandwidth usage and SMS management, but also just offering more Mac-savvy help with setting up - but that doesn't detract from its usefulness and value.